Art pieces in Detroit have been valued at around four billion, but some conservative estimates state that they may only fetch a one billion dollar price tag. A three billion dollar loss is a considerable hit to Detroit’s case. Fortunately, Detroit has had smaller court victories during the bankruptcy proceedings. U.S. District Judge Bernard Friedman affirms a previous ruling made by U.S. Bankruptcy Judge Steven Rhodes in August of last year. Judge Rhodes ruled that the casino revenues were city property protected by the bankruptcy process. This means creditors were not allowed to go after the profits made by Detroit’s casino tax. This money was determined to belong to the city and is therefore protected during Detroit’s restructuring process. 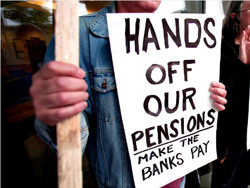 An approval of the adjustment plan may negatively affect pensions for retirees. Because of this protesters, whose pensions are in danger, gathered outside of Detroit’s federal courthouse as voting finalized. Many say that the bankruptcy plan is only protecting the assets of large banks at the cost of their retirement packages. Still multiple groups representing the retirees, urged a “yes” vote, warning that worse results may come if the plan is rejected!